US Army MWR :: View Event :: Mamma Mia! Date: Aug 18 2018, 5:45 p.m.
Over 54 million people all around the world have fallen in love with the characters, the story, and the music that make MAMMA MIA! the ultimate feel-good show! A mother. A daughter. Three possible dads. And a trip down the aisle you’ll never forget! Writer, Catherine Johnson’s, sunny and funny tale unfolds on a Greek island paradise. On the eve of her wedding, a daughter’s quest to discover the identity of her father brings three men from her mother’s past back to the island they last visited 20 years ago. The story-telling magic of ABBA’s timeless songs propels this enchanting tale of love, laughter, and friendship, creating an unforgettable show. 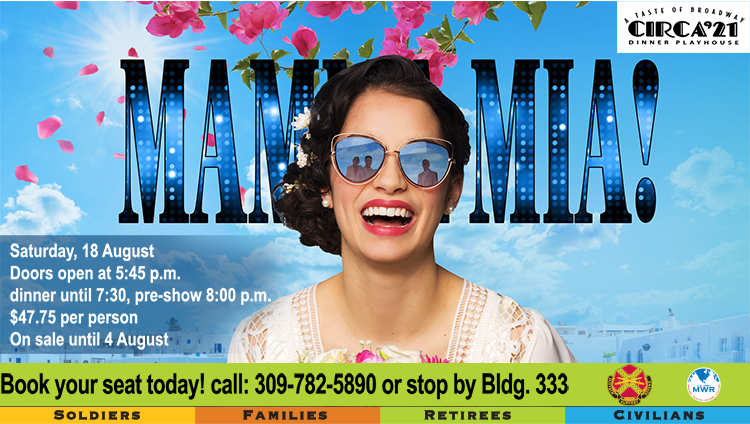 A large cast, nonstop laughs, and explosive dance numbers combine to make MAMMA MIA! pure joy for audiences! The Leisure Travel Office has discounted tickets for this dinner show for $47.75 each. Doors open at 5:45 p.m., dinner until 7:30 & pre-show at 8 p.m.
On sale through 4 August!